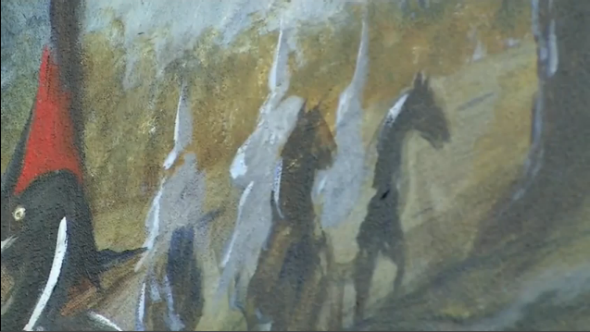 Florida KKK courthouse mural: controversial, finally. The portion of the mural in question. Lawlessness among ex-slaves and troublesome whites was the rule of the day. No relief was given by the carpetbag and scalawag government or by the Union troops. The result was the emergence of secret societies claiming to bring law and order to the county. One of these groups was the Ku Klux Klan, an organization that sometimes took vigilante justice to extremes but was sometimes the only control the county knew over those outside the law. The Klan faded from view at the end of Reconstruction. It had minor come-backs in the 1920’s and mid 1950’s. Since then it has become the subject of legend rather than a cause of fear. As a Change.org petition to remove the scene explains, Baker County’s history with the KKK is grislier than Barber suggests. In 1920, four black men in the county allegedly involved in the death of a prominent white farmer were seized from their jail cells, dragged across the county, shot, and lynched. Moreover, hundreds of black people were lynched during the KKK’s “minor come-back” in the 1920s, when it membership ballooned to perhaps 8 million. If the KKK remains “a cause of fear,” it is because the organization is one of the deadliest terrorist groups in American history. The petition to remove the KKK scene had 190 signatures as of Thursday at noon. A competing petition to keep the scene had 777 signatures.